There are many different cloud-based services available for backing up your Boulevard data online. Due to the many variables outside of our control, Main Street Software cannot provide any support pertaining to the setup/installation for either of the cloud-based options mentioned below. An account must be created with one of the options below, and then the app installed on your computer before proceeding. For instructions on installing one of the services, please visit their website using the links below. 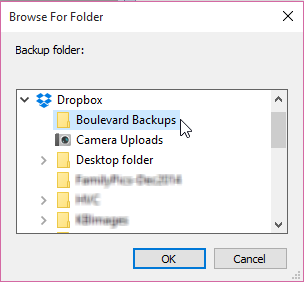 Tip: To keep your backups together and organized, we suggest after installing one of the options above, create a Boulevard Backups folder. 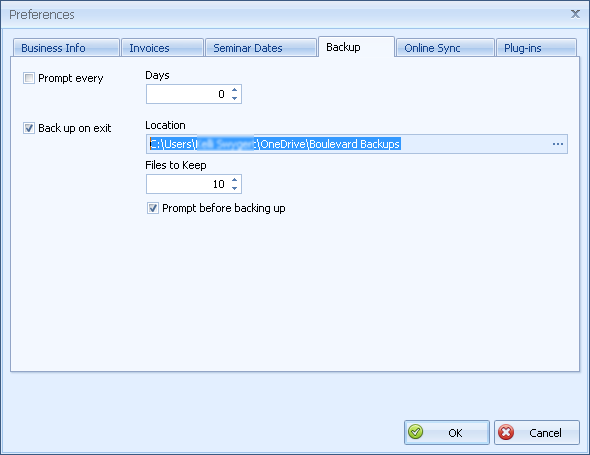 Select Prompt before backing up if you want Boulevard to ask before initiating the backup each time you close the program, as well as how many backup files to store in the most recent backup files field.